Black Knight Games is pleased to be hosting another Open House, this time we be kicking off the next set – Ravnica Allegiance! 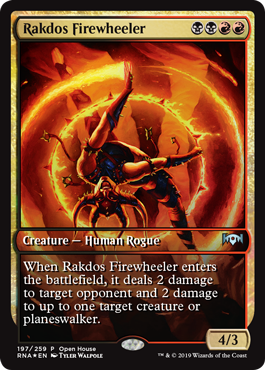 Participants Get: At Open House, new players get a Welcome Deck, and a tutorial showcase of the game in an open-play environment, they also get a Foil Full-Art Rakdos Firewheeler promo if you play at least two games! Bring a Friend: If you are an established Magic player, you are invited to participate to teach new players, and to bring your friends in who would like to try MTG! Established players will also be given a promotional Foil Full-Art Boros Challenger if they bring a new player with them, or are found to be helpful teachers to new players. The Open House event is a new tradition that precedes the Prerelease by a week, giving new players the perfect introduction leading in to the most exciting event each season! Our Demo Day this year was a huge success thanks to you! Here are just a few clips from the event, and if you couldn’t come out for it this time around, we hope you’ll be able to join us Black Friday weekend 2019! Today Evan is giving you folks a preview of what you can expect in the Demo Day Goody box! Check out the video below to get some of the details on Demo Day and see some of the awesome stuff you’ll be getting with your entry! Demo Day 2018 – Try All the Games! Try more Games! Demo Day is the best time to give new games a go, as it is sort of like our own mini-convention floor! We will have a ton of staff & volunteers around to show you how to play all kinds of different games. Basically it’s the best time of the year to try new games, because you can try a bunch at once, then you can use the coupons and goodies in the Goody Box to help you get into the games you like the best! When: Saturday, November 24th, 12:00pm – 5pm. You Get: The BKG Goody Box (filled with awesome samples and goodies), a free ballot for the Demo Day Draws, and access to all of the demonstration games. Demo Day Draws: We will be drawing for a free $50.00 Black Knight Games gift card, as well as some other fun prizes. We will have many stations where a BKG staff member, Standard Bearer, or volunteer will be running a games demonstration. Simply go up to them and ask to play and they will teach you the basics for the game! In addition to that they will give you another ballot for the Demo Day Draws! If you would like to volunteer to teach a game that you love to those attending Demo Day contact Jay and let him know! Learn to Play: Everyone that participates will need a Keyforge deck either from the starter set (not the demo decks) or that they purchased separately, and tokens from the starter (or a suitable substitute). Players will be paired off for a round of gaming to try out the rules. We will have a staff on hand to help explain and clarify during this first round. This round will not count towards the tournament, and is just to help players get their feet under them. Tournament: After the demo round we will play a 3 Round Tournament. Anyone that finishes at least 2-1 will win another Archon Deck! It also gives you a chance to claim your third Active House card and a House poster. Finally, each of the event’s top three players will designate one House for the store’s Create-an-Archon poster. Keyforge App: Don’t forget to register your deck(s) on the Keyforge App! This amazing feature will allow all decks in tournament play to be tracked and rated/ranked – which will really help you earn some bragging rights! So join us for the first tournament in what we believe will be a very successful new game at BKG! Black Knight Games has been selected as a very exclusive number of locations to host a Keyforge Early Access event! Format: Attend a KeyForge Pre-Launch, and you’ll get a better sense of what this game is all about. During the Pre-Launch, you’ll have your chance to sample all the game’s wild and explosive back-and-forth action with a Keyforge Demo Game. Some will also be able to buy an early access deck, allowing you to continue the fun with pick-up games! Swag: Join the rush of players looking to collect their KeyForge decks at the Pre-Launch, and you can even claim some cool swag! Buy Early: We will have a limited number of Keyforge decks available to purchase on the day of the event (max 1 per person). These will be in short supply, so sign up now to reserve yours! Keyforge releases on Thursday, November 15th. Check out our Launch Tournament as well!